The upscale Résidence du Pré aux Clercs could not be more central, located just off the Place de la Libération by the Palais des Ducs de Bourgogne, but its 5 guest rooms fill early and often. The modern 3-star, 35-room Hôtel des Ducs, just east of the Place de la Libération, is also right in the center only minutes from the major sights. Most parking is 10 minutes away, and the Wifi can be problematic, but staff are helpful and rooms comfortable. At the upscale La Cour Berbisey, 600 meters (7 minutes' stroll) southwest of the Place de la Libération, you can enjoy the indoor swmmming pool and sauna, but there are only 5 guest rooms in this nicely renovated 17th-century hostelry. The 5-star, 68-room Grand Hôtel La Cloche overlooking Parque Darcy is a grand bit of Dijon history. Built for the elite passengers on the early Paris-to-Marseille railway, it is still Dijon's Grande Dame. The modern 3-star, 90-room Ibis Styles Dijon Centre is well-located on turn-of-the-century Place Grangier, with its fine Art Nouveau buildings, one short block north of Rue de la Liberté and only 500 meters northwest of Place de la Libération. You're still close to the main sights, and to the Antiques District, Parque Darcy, and the Gare de Dijon. 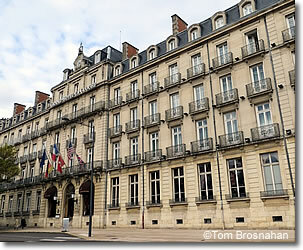 Facing the Gare, a favorite is the modern 3-star, 30-room Kyriad Prestige Dijon Centre. Above, Grand Hôtel La Cloche today. 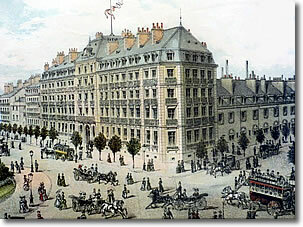 Below, Hôtel de la Cloche a century ago.